Luang Prabang, or Louangphrabang (Lao: ຫລວງພະບາງ, IPA: /luaŋ pʰabaːŋ/), a city located in north central Laos, is situated on the Mekong River about 425 kilometers (264 mi) north of Vientiane, the capital of Louangphrabang Province. The town of Luang Phrabang is best known for its blend of traditional Laotian urban architecture with nineteenth and twentieth century European colonial architecture. UNESCO noted that feature as distinctive, as well as its historical and religious heritage, when designating Luang Phrabang a World Heritage Site in 1995. Luang Prabang developed and grew at the confluence of Mekong River tributaries. It was the capital of the Lan Xang kingdom during the fourteenth century. The city received its name from a famous gold Buddha statue of the same name. The Silk Road passed through it, bringing great wealth and Buddhist monks who often established monasteries along the Silk Road, attracting generous donations for building temples. Luang Phrabang became a center for Theravada or Hinayana Buddhism featuring eighty monasteries. Wat Xieng Thong temple built in the sixteenth century serves as an outstanding example. Wat Xieng Thong temple presents a style of Buddhist architecture unique to Luang Phrabang, with a multi-layered roof and its facing side decorated with gold carvings. On the back wall of the temple, a Tree of Life depicts the story of Buddha. The monasteries in Luang Phrabang are all active, with attendant monks numbering near 1,200. Tai prince, Khun Lo named the place that would later become Laung Phrabang, Muang Sua, following a successful conquest in 698 C.E. Khun Lo had been awarded the town by his father, Khun Borom, associated with the Lao legend of the creation of the world. The Lao share that creation legend with the Shan and other peoples of the region. Khun Lo established a dynasty that held the kingdom Muang Sua in tributary servitude for nearly 100 years. 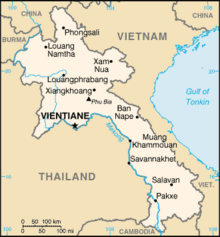 In the second half of the eighth century, the confederation of Nan-chao meddled often in the affairs of the principalities of the middle Mekong Valley, leading to its occupation of Muang Sua in 709 C.E. Nan-chao princes and administrators replaced the aristocracy of Tai overlords. Dates of the occupation remain unclear, but their rule has been assumed to have ended well before the northward expansion of the Khmer empire under Indravarman I (r. 877-889) and extended as far as the territories of Sipsong Panna on the upper Mekong. In the meantime, the Khmer dynasty founded an outpost at Xay Fong near Vientiane, and the Champa dynasty expanded again in southern Laos, maintaining its presence on the banks of the Mekong until 1070 C.E. Chanthaphanit, the local ruler of Xay Fong, moved north to Muang Sua and was accepted peacefully as ruler after the departure of the Nan-chao administrators. Chanthaphanit and his son had long reigns, during which the town became known by the Tai name Xieng Dong Xieng Thong. The dynasty eventually became involved in the squabbles of a number of principalities. Khun Chuang, a warlike ruler who may have been a Kammu (alternate spellings include Khamu and Khmu) tribesman, extended his territory as a result of the warring of those principalities and probably ruled from 1128 to 1169. Under Khun Chuang, a single family ruled over a far-flung territory and reinstituted the Siamese administrative system of the seventh century. During that period, Mahayana Buddhism subsumed Theravada Buddhism. Buddhist Temple at Haw Kham (Royal Palace) complex. Xieng Dong Xieng Thong experienced a brief period of Khmer suzerainty under Jayavarman VII from 1185 to 1191. By 1180, the Sipsong Panna regained their independence from the Khmer dynasty. In 1238, an internal uprising in the Khmer outpost of Sukhothai expelled the Khmer overlords. Xieng Dong Xieng Thong, in 1353, became the capital of Lan Xang. In 1560, King Setthathirath I moved the capital to Vien Chang, which remains the capital. In 1707, Lan Xang disintegrated and Luang Prabang became the capital of the independent Luang Prabang kingdom. When France annexed Laos, they recognized Luang Prabang as the royal residence of Laos. Eventually, the ruler of Luang Prabang became synonymous with the figurehead of the French Protectorate of Laos. When Laos achieved independence, the king of Luang Prabang, Sisavang Vong, became the head of state for the Kingdom of Laos. Kuang Si Falls. A waterfall twenty nine kilometers (eighteen miles) south of Luang Prabang. Tham Phu Si. A small cave temple on Mount Phousi in Luang Prabang. Royal Palace Museum (Haw Kham). The Royal Palace (official name "Haw Kham") had been built in 1904 during the French colonial era for King Sisavang Vong and his family. Wat Aham. Originally built in 1527, the current temple had been constructed in in 1818 in classical Luang Prabang style. Wat Mai Suwannaphumaham. The largest and most richly decorated of the Buddhist temples in Luang Prabang. Wat Manorom. Amajor Buddhist temple and monastery in Luang Prabang. Wat That Luang. Date originally to the Khmer dynasty (eleventh to thirteenth centuries), the stupa had been rebuilt in the 1930s. Wat Wisunarat. The oldest operating temple in Luang Prabang. Wat Xieng Muan. Although probably built originally centuries earlier, Wat Xieng Muan (full name Wat Xieng Muan Vajiramangalaram) had been built by Phragna Sisonxay in 1853 during the reign of King Chantharath Koumane (1850-1868). Wat Xieng Thong. A Buddhist temple (wat) in Luang Phrabang built in 1560 by King Setthathirath. Mosaic detail from the wall of Wat Xien Thong temple, Luang Prabang, Laos. ↑ UNESCO, Town of Luang Prabang. Retrieved September 17, 2008. ↑ Keat Gin Ooi, Southeast Asia: A Historical Encyclopedia, From Angkor Wat to East Timor (Santa Barbara, Calif: ABC-CLIO, 2004), 796. ↑ UNESCO, World Heritage Video. Retrieved September 17, 2008. ↑ John Stewart Bowman, Columbia Chronologies of Asian History and Culture (New York: Columbia University Press, 2000), 453. ↑ Andrea Matles Savada Laos: A Country Study. Area Handbook Series (Washington, DC: Federal Research Division, Library of Congress, 1995), 6. ↑ Thi Dieu Nguyen The Mekong River and the Struggle for Indochina: Water, War, and Peace (Westport, Conn: Praeger, 1999), 10. ↑ Ismail Serageldin and Joan Martin-Brown, Partnerships for Global Ecosystem Management Science, Economics and Law: Proceedings and Reference Readings (Washington, DC: World bank, 1998), 269. ↑ Cultural Profiles, Laos Cultural Profiles ProjectCultural Profile: Wat Xieng Muan. Retrieved August 31, 2008. Bowman, John Stewart. 2000. Columbia Chronologies of Asian History and Culture. New York: Columbia University Press. ISBN 9780231110051. Nguyen, Thi Dieu. 1999. The Mekong River and the Struggle for Indochina: Water, War, and Peace. Westport, Conn: Praeger. ISBN 9780275961374. Ooi, Keat Gin. 2004. Southeast Asia: A Historical Encyclopedia, from Angkor Wat to East Timor. Santa Barbara, Calif: ABC-CLIO. ISBN 9781576077702. Savada, Andrea Matles. 1995. Laos: A Country Study. Area Handbook Series. Washington, DC: Federal Research Division, Library of Congress. ISBN 9780844408323. Serageldin, Ismail, and Joan Martin-Brown. 1998. Partnerships for Global Ecosystem Management Science, Economics and Law: Proceedings and Reference Readings. Washington, DC: World bank. ISBN 9780821342657. Town of Luang Prabang UNESCO. Cartes postales du Laos (french website). Pictures of Luang Phrabang, Laos: Monks, Wats, and a boat tour on the Mekong River..
Violence against Christians in Vientiane and Luang Phrabang.